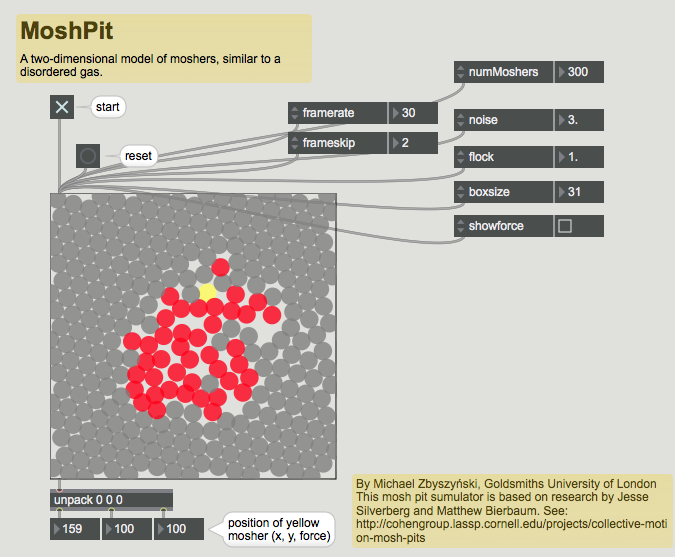 A two-dimensional model of moshers, similar to a disordered gas. I'd never heard of that game until now. Interesting...? I'd be curious to hear from anybody who uses this about what I could add to it. This is a pre-release that could easily have more features. But, what features? ^both of these suggestions are probably too frivolous to focus your hard work here around, BUT! more important suggestions i have are: -watching something like this makes me want to hear a sonification of the collisions... perhaps you could output more movement data of the overall crowd through the outlet than just the single yellow's position... or maybe, just output some representation of the 'showforce' parameter? Somebody else has figured out the maths for this simulation. It's a bit tricky as it is, so probably won't add additional behaviors. Figuring out the collision energy might be possible, though. I'm thinking I should dump the positions and force values for the red moshers out another outlet. Or, send all of them as a list like , , , . If I was outputting everything, it would be quite easy to add a flag to suspend drawing, or make another object that just didn't do that. I've just added a v0.2 that outputs all of the particles out the right outlet. Also, it has an attribute to turn off drawing in the object. I also get a hang...of which the patch never opens.